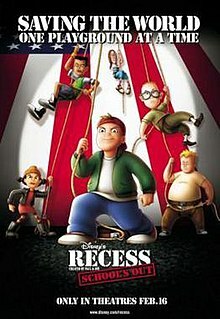 Recess: School's Out (also known as Recess: The Movie - School's Out and Recess: The Ultimate Summer Vacation or Summer Vacation: The Ultimate Recess in the working titles) is a 2001 American animated comedy film based on the Disney television series Recess. It was produced by Walt Disney Pictures, Walt Disney Television Animation and Walt Disney Television Animation Digital Production with animation done by Sunwoo Animation and Sunwoo Digital International. The film was distributed by Buena Vista Pictures Distribution, premiered on February 10, 2001 and released theatrically in the United States on February 16, 2001. The film also serves as the show's season five finale. An unknown group steal a top-secret project from a U.S Army base in the Nevada Desert, whereupon they make their way to secure Third Street Elementary School as base of operations per their leader's instructions. Prior to their arrival, T.J. Detweiler and his friends pull off one last big prank at their school before they break off for summer vacation. T.J. is shocked that his friends are heading to summer camps, leaving him bored at home. While heading for a play date with the school's snitch Randall, he comes across something strange involving a tractor beam being used within the school, but finds no-one believing his story. Left with no choice, T.J. attempts to convince the school's principal, Peter Prickly, to abandon his time at a golf club to check things out, only to witness him dematerialize when he tries entering the school. Out of options, T.J. blackmails his sister Becky into driving him to each of his friend's summer camp to bring them back and help him investigate more. Although they accuse him of inventing a plot to drag them back, the group witness the tractor beam being used from the school and agree to help him investigate. The next day, the kids find Prickly's golf pants in a dumpster with a note requesting help, leading them to infiltrate the school that night. In doing so, they find the auditorium converted into a base housing the tractor beam, but are caught spying and chased by guards, who capture T.J. in the process. Brought to Prickly, the pair learn that the school has been taken over by an anti-recess group led by Dr. Phillium Benedict, a former friend of Prickly's from their early teaching years. Prickly explains to T.J. how Benedict attempted to abolish recess to improve test grades when he was appointed as the school's principal in the spring of 1968, much to the protest of teachers and parents alike. After Prickly ended his plans by informing the superintendent of the situation, Benedict was replaced by him as principal, losing his then-girlfriend, Muriel P. Finster, due to his political views. Prickly explains that Benedict later entered politics, becoming Secretary of Education, until the president fired him for attempting his plans again, but on a nationwide scale. Both T.J. and Prickly vow to stop him, when they learn that he plans to abolish summer vacation by altering the moon's orbit, thus putting Earth into a permanent ice age. Left to rescue their friend and Prickly, T.J.'s friends have Becky help them bring back all the children from the school to stop Benedict's group from succeeding in their plans. Through a plan by Gus Griswald, the kids manage to incapacitate his guards, gaining access to the auditorium. As Benedict prepares to have the kids subdued, Finster arrives, having coming across what T.J. had discovered, bringing the school's staff with her to help in stopping him. After Benedict manages to trigger the tractor beam, T.J. tosses a baseball to Vince LaSalle, who destroys the beam's power core, foiling Benedict's plans for good. As Benedict and his group are arrested for their actions, T.J. and his friends find themselves commemorated as heroes, alongside the other kids and staff, and plan to spend the rest of the summer together. Before leaving, T.J. meets with Prickly, who thanks him for reminding him of his true motivation to help kids at school. As they both mutually respect each other with their nicknames, Prickly advises T.J. at what he can expect when he returns to school in September, prompting T.J. to reply that his return is a long way off, before heading to a pond with his friends. Note: "Purple Haze" by The Jimi Hendrix Experience was also used in the film, though it is not included on the soundtrack. On Rotten Tomatoes, a review aggregator, the film has an approval rating of 61% based on 69 reviews, with an average rating is 5.8/10. The site's critical consensus reads, "Though basically a TV cartoon stretched out to movie-length, Recess has enough successful jokes and smart writing to make it a worthwhile view." On Metacritic, the film has a weighted average score of 43 out of 100, based on 20 critics, indicating "mixed or average reviews". Audiences polled by CinemaScore gave the film an average grade of "A–" on an A+ to F scale. The film earned $36.7 million in North America and another $7.8 million from other countries. The worldwide gross was $44.5 million, against a $23 million budget. Recess: School's Out, was released on VHS and DVD on August 7, 2001. ^ "Recess: School's Out". American Film Institute. Retrieved March 7, 2017. ^ a b c "Recess School's Out (2001)". Box Office Mojo. Retrieved 2015-01-26. ^ "Scale Down the Bad Guy in Kids' Animated Films". The Los Angeles Times. Retrieved 2010-11-10. ^ a b "Recess: School's Out (2001)". Rotten Tomatoes. Retrieved 2015-10-03. ^ "Recess: School's Out reviews". Metacritic. Retrieved February 26, 2018.